4 dams and 2 permanent streams The largest dam has a huge 27 mega litre capacity. A new pump house with a Grundfos pump, supplies water to shed area and outlets across the farm. Underground irrigation pipes leading off from the main that are 6, 4, and 3-inch PVC pipes. Incredible views of Amamoor, rich red volcanic soils, a beautiful homestead on 142 acres makes this an unmistakably desirable property. The dams provide an unlimited supply of water from run-off and 2 permanent streams. As for the land, it varies from areas of flats to gentle slopes, whilst at the very back of the property is a glorious steep hill from which you have unbroken views from every degree on the compass. Situated on an escarpment centrally located on the farm, the homestead is roughly 800 metres from Diamondfield Road. The home is superbly designed built around a lovely courtyard. It is positioned to take full advantage of the incredible views of Amamoor from the living areas. Being double brick for the most part, and brick veneer for the remainder, it is a solid attractive build. The master bedroom is air conditioned with an ensuite and WIR. The other 3 bedrooms are of a good size, also with BIRs. Two of the bedrooms are ideally suited as guest suites, having their own living area. A separate office is set up, making use of the good Internet and mobile phone service. There are 3 living areas, each with their own special features. There is a sunken lounge, cathedral ceilings, spacious family room and oak finished kitchen with superior quality appliances. The separate dining room for formal occasions finishes off a very thoughtfully designed plan. Throughout, the floor coverings and fixtures are of a very high standard. The cottage is a very well built cement block and timber structure in superb condition. It has 3 bedrooms, one bathroom and has an open designed kitchen, dining and living room. A shed and carport are behind the house. Located about 250 metres off the Diamondfield Road, it is currently rented out by excellent tenants. The shed which is located about 75 metres from the homestead has been erected to the highest building standards. It has a very solid steel structure and is 25 m x 15 m. There is a workshop area with 3-phase power, an area for farm vehicles and implements, and room for trucks and cars. The land is mostly red volcanic soils with clay in the valleys. Predominantly, it is well pastured with a variety of grasses. Its nutritional value is reflected in the appearance of the Drought-master cattle. The land can comfortably support 60 plus breeders. The north facing aspect of the majority of the land is ideal for plant growth. In the past, there was a large mango orchard. All its underground irrigation pipes are still in place. The metal cattle yards are ideally placed for all the necessary activities with a loading ramp, several yards, a race, crush and a specialised weaning yard. Currently, there are no horse facilities but there are beautiful well-fenced paddocks waiting to house your horses. The quantity of available water is astounding. There are 4 dams, 2 are fed by permanent creeks and the others by run-off. The largest dam has a huge 27 mega litre capacity. A new pump house with a Grundfos pump, supplies water to the shed area and to various outlets across the farm. There are underground irrigation pipes leading off from the main that are 6, 4, and 3-inch PVC pipes. The house drinking water is from rainwater tanks and the gardens use dam water. 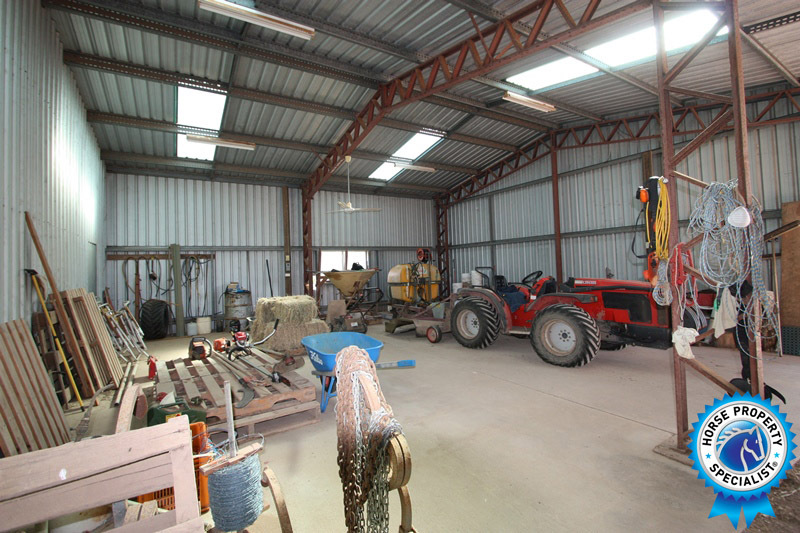 The farm machinery and stock are available for sale, separate to the property, by negotiation with the owner.